Continuation from the previous 79 parts, the whole series can be found at http://www.nikoport.com/columnstore/. Given the number under-the-hood performance & manageability improvements that recent RC versions of SQL Server 2016 have had, I have decided to revisit them and update my previous blog posts. Especially I was interested in the predicate pushdown, which had some important limitations – like the lack of the GROUP BY support. 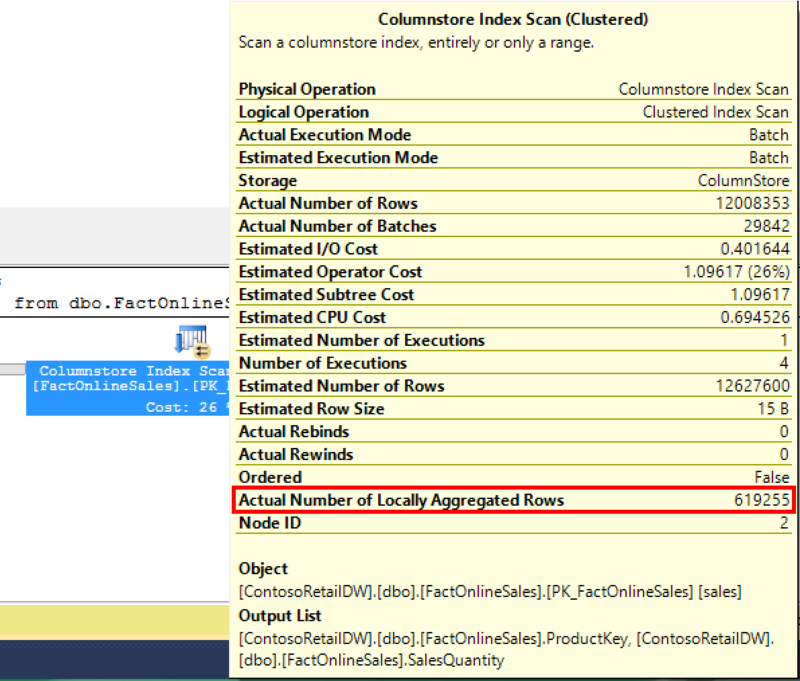 While revisiting the Columnstore Indexes – part 59 (“Aggregate Pushdown”), I have noticed some significant that were definitely worth blogging about. The actual number of rows in the plan were 12008353! The real number of rows that are stored inside the dbo.FactOnlineSales table are 12627608 and not that number! There are a little bit over 600.000 rows missing! Everything was right. The result was 12627608 rows. I have had not even one elimination predicate, I did not use the WHERE clause – is there a mistake in the execution plan? Gives us our perfect 12627608 rows. Is there any more information on this operation? There we can see “Actual Number of Locally Aggregated Rows” showing us the needed numbers, which can actually be expanded to see the statistics per used Thread. With the latest addition of the detailed properties, such as actual execution time and actual elapsed time, plus the IO properties, we have information on the locally aggregated rows as well. There is a lot of potential with this new information and I am really looking forward to see the upcoming releases of SQL Server. But what is the local aggregation ? Is it happening in all predicate pushdown operations? Here we see that the local aggregation was executed against all rows, which makes sense – since the predicate pushdown is a kind of a local aggregation. 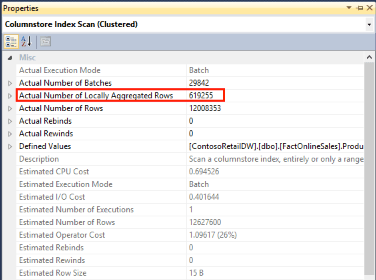 From all my tests the local aggregation takes place if we are scanning whole table or using a Group By. Well, well – let me see: could Segment Clustering actually help this operation ? 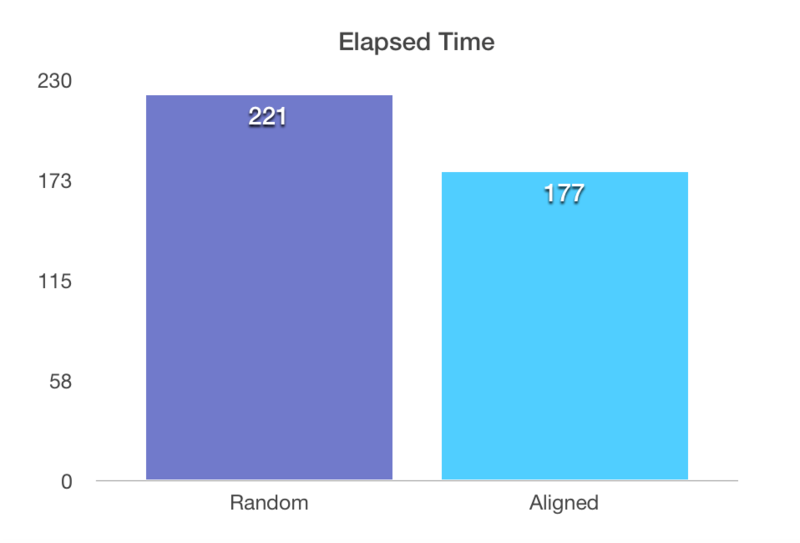 Like ordering the data in order to improve the aggregation performance. 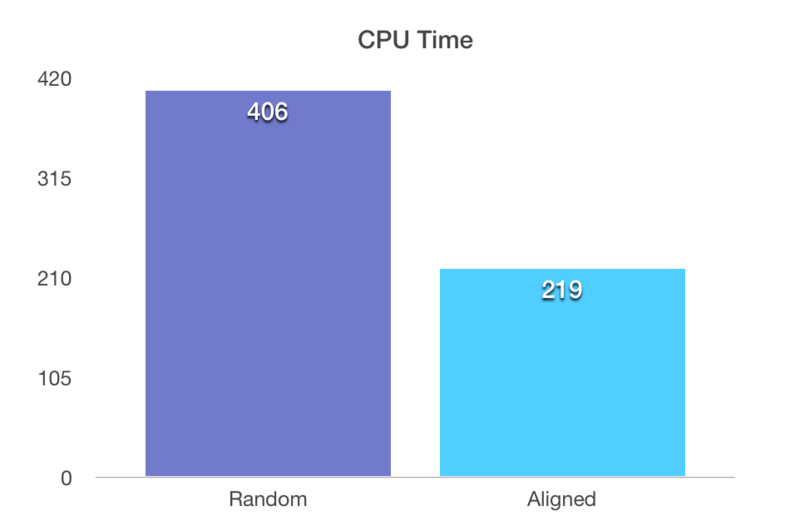 219 ms for the CPU time and 177 ms for the elapsed time for the aligned scenario. Very nice improvement from the previous version, this one must have been be a couple months in the CTP’s, I rapidly checked that it already was in CTP 3.3. My theory would be that adjacent rows with the same key are aggregated locally. It’s not possible to force the sort order within a segment AFAIK so this cannot be fully tested. Maybe we can entice the CS compressor to use a certain sort order if we add artificial data columns to the table. I experimented with that and saw effects but I never figured out how exactly the sort order is chosen. I don’t even think its a uniform sort order but more of a decision tree that is used to minimize entropy. >My theory would be that adjacent rows with the same key are aggregated locally. It’s not possible to force the sort order within a >segment AFAIK so this cannot be fully tested. This was my expectation and so far I interpret the results – you get some improvements but not exactly what one would hope for. >Maybe we can entice the CS compressor to use a certain sort order if we add artificial data columns to the table. I experimented >with that and saw effects but I never figured out how exactly the sort order is chosen. I don’t even think its a uniform sort order >but more of a decision tree that is used to minimize entropy. Interesting! I do not consider practical any of such deep processor influences, since Microsoft can change behaviour in a point release, effectively destroying all such efforts. But hey, I do agree – would be cool from the technical perspective!